SHRAPNEL (AUS) (Brown 2007-Stud 2012). 3 wins-1 at 2-at 1200m, A$293,935, SAJC Yallambee Classic, Gr.2, Breeders' S., Gr.3. Half-brother to SW Wanted. Sire of 48 rnrs, 19 wnrs, inc. Kid Flash, Much Deeper, River Fire, Princess Lottie, Elle's Nel, Bank of Erin, Flying Fragments, Shrapelli, Thornbro, Tip Jar, All Political, Fairy Fragments, Metralla, Canon King, Distortion, Landmine, Miss Nellie, Pellet, Shrapnel Impact, etc. Erins Zar (g. by Zariz). 4 wins to 1400m, A$77,225, to 2016-17, 2d ATC Schweppes H.
Bank of Erin (f. by Shrapnel). 2 wins. See below. Cord. 9 wins from 1200m to 1600m, QTC Stradbroke Bar H., 2d BTC Tender Plus H., QTC Dual Scope H., 3d QTC Maxam H., Bengalla Lad H.
Centennial Son. 4 wins to 1250m, 3d BRC Zig Zag Foundation H.
Cycles. 5 wins at 1050m in Aust. and Philippines. Erins Princess. 2 wins. See above. Charlie Charlie. Winner at 2100m in Aust. Centrev - Zapper (Mac.). 12 wins to 1500m in Aust. and Macau, VATC Hurricane Sky H., 2d SAJC Adelaide Fresh H., 3d VRC Gribbles Group H., SAJC Do-Re-Mi H.
Centennial. 3 wins. See above. Marpesia. 11 wins from 1400m to 1750m, A$95,390, 2d AJC Crossing H., Beechwood Grange H., 3d STC Canterbury Leagues Club H.
Short Run. 7 wins to 1200m in Aust. Authority. 2 wins at 1450m, 1600m in Aust. Agamemnon. 3 wins at 1600m, 2000m in Aust. Abraxas. 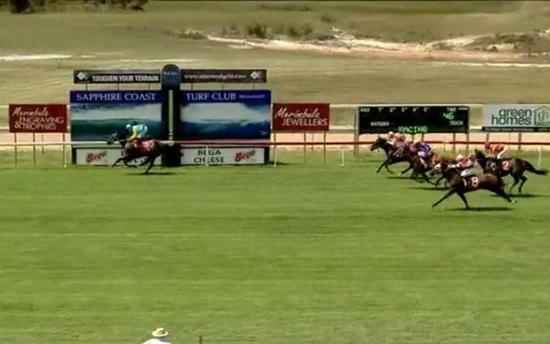 Winner at 2300m in Aust. Clemency. Winner at 1200m in Aust. Savage City. 6 wins to 1500m, 2d BTC Alcimedes H., QTC Punchestown H.
Areumdaun Tansaeng. 2 wins at 1300m, 1700m in Korea. Daesanyeogeol. Winner at 1200m in Korea. Century City. 5 wins. See above. Cooldarragh King. 9 wins from 1000m to 1600m, 2d STC Caringbah RSL H., 3d NSW Tatt's RC JA Inglis H., STC View Club H.
Exclusive Man. 9 wins to 1200m, 2d STC Hawaii H.
Call Me Dapper. 4 wins to 1200m in Aust. Swift Luck. 4 wins from 1300m to 1600m in Aust. ABSALOM (Abwah). 11 wins-5 at 2-to 7f, Haydock Sprint Cup, Gr.2, Milan Premio Chiusura, Gr.2, Ascot Cornwallis S., Gr.3, Diadem S., Gr.3, 2d Newmarket Challenge S., Gr.3, 4th Haydock Sprint Cup, Gr.2, Ascot Diadem S., Gr.3, Royal Ascot Cork & Orrery S., Gr.3. Sire. ADONIJAH (High Line). 6 wins from 1m to 1¼m, Epsom Diomed S., Gr.3, Sandown Brigadier Gerard S., Gr.3, 2d Ascot Queen Elizabeth II S., Gr.2, Goodwood Waterford Crystal Mile, Gr.2, Newmarket Earl of Sefton S., Gr.3, Goodwood Clive Graham S., L, 3d Longchamp Prix Ganay, Gr.1, Prix d'Ispahan, Gr.1, 4th Royal Ascot King Edward VII S., Gr.2. Sire. LUCRIMATE (Prince Tenderfoot). 5 wins-2 at 2-from 1000m to 1600m, Milan Premio del Giubileo, L, 3d Varese Premio Virginio Curti, L.
Petinara (Hul a Hul). Winner. See above. Safat. 3 wins-2 at 2-at 1400m, Rome Premio Ripon, Premio Adam, 2d Rome Premio Cliff of Moher, Premio More So, 3d Rome Premio Rapido. 2 wins at 900m, 1200m in 2017-18 in Aust.